Call it a pink-blue coalition — the moderate Republicans and the Democrats. (Or maybe the donkey-rhino‡ coalition). But after a weeklong shutdown? Two weeks? More? Imagine if minority leader Nancy Pelosi (and House minority whip Steny Hoyer) called Boehner’s bluff by promising sufficient Democratic votes to support his speakership in order to resume the federal government and to raise the US debt ceiling. 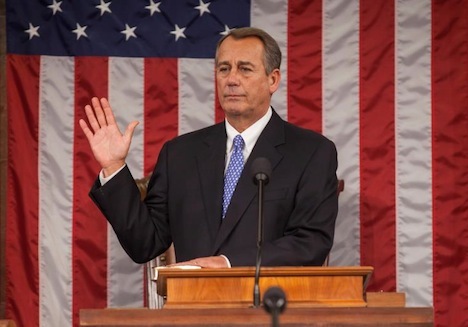 Would Boehner take that deal? It might not even need to come to that if Boehner simply allowed a free up-and-down vote on funding the government. With Democratic support, a minority of the Republican caucus could pass a continuing resolution, which would also pass in the US Senate, where Democrats hold a 54-46 advantage. The central question to the shutdown crisis now seems to be whether Boehner can do so without jeopardizing his position as speaker of the House. It wouldn’t be entirely unprecedented — if you think about congressional politics from, say, the 1930s through the 1960s, it’s almost as if the United States featured a three-party system: Republicans, ‘National’ Democrats and ‘Southern’ Democrats. In that light, the coalition that passed perhaps the most important legislation of the last half of the 20th century — the Civil Rights Act of 1964 — was a cross-party coalition. Northern Democrats supported the law by a margin of 145 to 9 and Republicans by a margin of 138 to 34, while Southern Democrats almost wholly opposed it by a margin of 7 to 87. Sure, a handful of Republicans, notably then-senator Barry Goldwater, opposed the law, and technically, pro-civil rights Democrats outnumbered anti-civil rights Democrats within the party caucus. 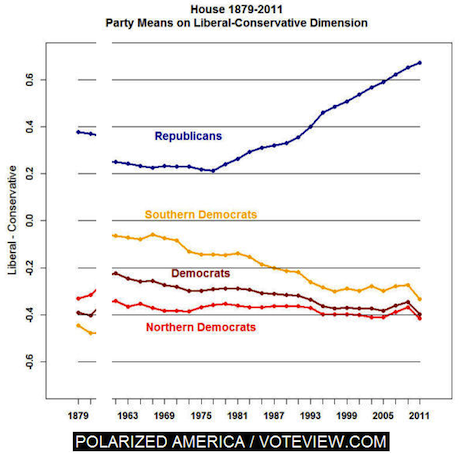 There wasn’t a rule that both northern and southern Democrats had to agree on an issue in order for the Congress to pass legislation in the middle of the 20th century, but Republicans and southern Democrats routinely worked together to pull Congress in a more conservative direction. A more recent example? Former Republican president George H.W. Bush signed the Omnibus Budget Reconciliation Act of 1990, which raised US income tax rates but also put the country’s finances on the path to a budget surplus. Though he suffered massive criticism from the conservative right for reneging on his famous ‘read my lips — no new taxes’ pledge, the 1990 budget passed the House of Representatives on a narrow cross-coalition of moderate Democrats and Republicans. The bill won just 47 of 173 Republican votes and 181 of 255 Democratic votes. The spread was even more narrow in the Senate. Even in early October 2008, in the first days of the financial crisis from which the US economy is still recovering, Republican president George W. Bush (and treasury secretary Hank Paulson) won congressional support for the Troubled Asset Relief Program (TARP) to provide relief to the US financial sector by a cross-party coalition. In the US House, TARP passed with 172 of 235 Democratic votes and just 91 of 199 votes from Republicans — and that came after a 777-point drop in the Dow Jones Industrial Average a week earlier when the first House vote on TARP failed on a 228-205 defeat. [T]he trend is this: in both the House and the Senate, Democrats are slightly more liberal than their historic norm, and Republicans are significantly more conservative than at any other time on record. While both parties have veered from the center since around the mid-1970s, Democrats have become only slightly more liberal — and you can explain that change largely in the transformation of the American South from universal Democratic stronghold to Republican heartland, which began in the wake of the civil rights era. The Republicans, however, have become increasingly much more conservative. There are certainly many reasons for that — the fact that the natural conservatism of Southern politicians moved from the Democrats to the Republicans, but also the importance of primary elections in a system where ‘gerrymandered’ districts make general election victories all but assured for most House incumbents (both Republican and Democratic), the end of congressional earmarks (which gave congressional leaders some check upon their caucus), the influence of money in political campaigns, the increasingly shrill tone of right-wing and, increasingly, left-wing media that began in the 1990s with Rush Limbaugh’s success as a conservative radio host and the advent of Fox News. All of which helps to explain why the United States has reached this point, where a minority of House members can shut the entire government down over a law that was enacted in 2010 and was upheld by the US Supreme Court last summer. What it doesn’t readily explain is how Boehner, Obama and House Democrats might find a way to end Washington’s current debilitating standoff. ‡ A reference to the pejorative RINO — ‘Republican in Name Only’ that especially conservative Republicans sometimes apply to more moderate Republicans. Many thanks to Sean Callaghan for his insight as I worked through this post. Previous PostDoes this week’s political crisis in Italy represent Berlusconi’s last stand?Next PostWill the Maldives pull itself together to hold a free and fair presidential election?